CMM Quay Legal Group – Congratulations to our newly accredited team! Congratulations to our newly accredited team! Congratulations to Josephine, Harry, Rebecca, Michelle, and Ron for completing their Electronic Conveyancing Certificate Accreditation. CMM Quay Legal is proud to say that our conveyancers and solicitors are at the bleeding edge when it comes to implementing new technologies in our practice. 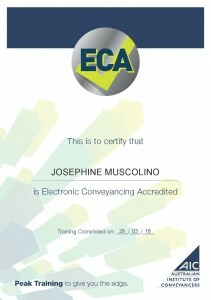 E-conveyancing is a significant step forward for Australian buyers and sellers; streamlining the process and taking advantage of the digital space. E-conveyancing will allow us to cut down on the manual and menial aspects of conveyancing and pass on the savings in labour costs to our clients. What’s more, by implementing a digital system of conveyancing, we are reducing the risk of manual error which goes along with old school methods. In addition, online conveyancing ensures that we can expedite the buying and selling process. Receive payments quicker and more securely online. CMM Quay Legal appreciates the significance which these changes will make to the Australian real estate market. We are on hand to help our clients navigate these changes and to guide them through the emerging technologies. As accredited solicitors and conveyancers we believe that these changes represent a positive movement forward for increasing efficiency in our industry.